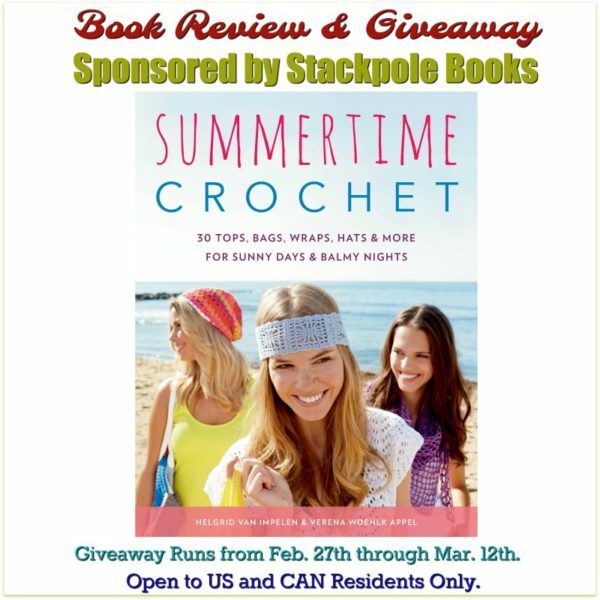 Summertime Crochet, published by Stackpole Books, is written by Helgrid Van Impelen and Verena Woehlk Appel. It contains 30 crochet patterns including tops, hats, a skirt, bikini tops, wraps, and sandals. You’ll also find bags and a few other accessories. The book will released in March 2018. It’s a must-have collection if you enjoy showing off your crochet talent during the summer months. This shawl is perfect for every occasion during the summer months. Whether it’s a day at the beach, a shopping trip or a wedding ceremony, this shawl is sure to compliment all your favorite outfits. And another pattern that is suitable for all your summer occasions is this skirt. The beautiful lace makes it perfect for a beach coverup, but you could also line it and wear it year round. This is perfect for the beach or for lounging in back yard on a hot summer’s day. It’s fun stripes can be crocheted to match a number of your favorite summer shorts or skirts. 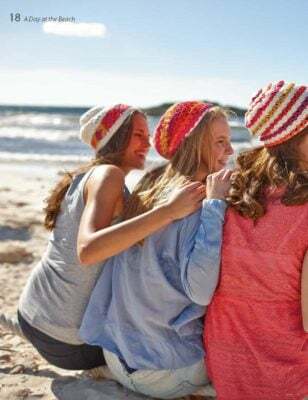 These hats are crocheted up in a cotton yarn, which makes them ideal for the summertime. This bikini top is worked in a triangular motif and tied at the back with two strings. This pattern is for the top that goes over the foot, and provides instructions on how to attach it to a pair of espadrille soles. They look oh so comfy! Enjoy this colorful mesh scarf in your favorite summer colors. It’s perfect for keeping you warm on the cooler summer days and evenings. Or wear it in the hot sun over your shoulders to protect them from sunburn. The title says it all. And it’s not just perfect for the summer, but also for the cold winter days. Last, but not least, here is a pretty laced and fringed poncho that you’ll enjoy wearing around the home or while out and about running errands. And now, you have the opportunity to win a copy for yourself. One winner will be chosen at the end of the giveaway. Giveaway is open to US and CAN residents who are 18 years of age or older. Giveaway runs from February 27th through March 12th. You can also order a copy from Stackpole Books when it becomes available. I’m always looking for my “next project” ~ this looks like it will do the trick! I’m always looking for summer patterns that are light airy looking just like these! Thank you for the Baby Blanket pattern. Not sure where I’m supposed to enter the contest for this giveaway. I’m so excited for this book! It looks great!